This famous photograph was taken during World War II on the island of Iwo Jima. Six brave soldiers are caught in the act of raising the America flag. What did this photograph tell the world? The message was very simple: “We are claiming this territory for the United States of America. The Japanese no longer control this island; the United States does. 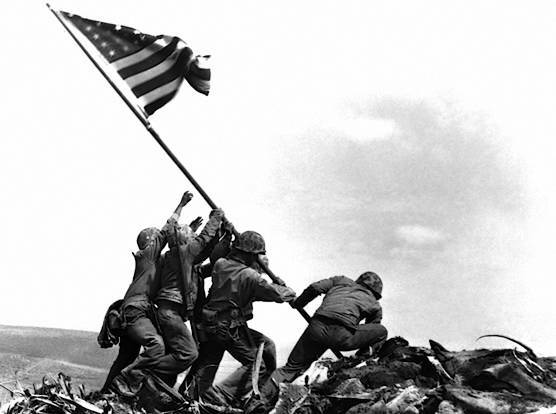 The two Japanese air bases on this island will no longer be used against us.” This photograph, the most famous and most reproduced photograph of all time, was telling the world that the little island in the South Pacific called Iwo Jima was conquered and overcome by the United States of America. Those five Marines and one U.S. Navy corpsman photographed in this picture were showing the world that this island was to be under the control of the U.S.A. It would no longer be in the hands of Japan. With this in mind, as a believer in the Lord Jesus Christ, what do you tell the world about your own life? As you walk through your day, do you show the world the flag of your Heavenly Father? Do you show to the world the Overcomer that dwells within you? Do you show to this dark and dying world that the island of your heart was conquered by Jesus Christ? What is this flag of our Heavenly Father? This flag is one that cannot be seen physically, but which is unfurled in the circumcised heart of one who has been conquered by the living God. “Nevertheless the foundation of God standeth sure, having this seal, The Lord knoweth them that are his. And, Let every one that nameth the name of Christ depart from iniquity” (2 Tim. 2:19). By flying this flag within your very own heart will you be able to tell to the whole world that this land has been conquered by Jesus Christ and that you now belong to Him. So I ask you again: Does the world see the flag of your Heavenly Father or does the world see that same old flag that the rest of the world flies? They are still under Satan’s sinful empire. Do you fly the flag of your enemy in your daily walk or do you fly the Father's flag? Dear Father, I pray that we be not ashamed to fly Your flag in our daily walk with You. I pray that You give us the strength and courage to fly this flag in order to tell this dark and dying world that there is a Liberator just standing at the beach head waiting to invade and conquer their own lives. Father, help me show the world that the territory of my heart has been overcome and conquered by the Lord Jesus Christ. In your Son's name. Amen! “What? know ye not that your body is the temple of the Holy Ghost which is in you, which ye have of God, and ye are not your own? For ye are bought with a price: therefore glorify God in your body, and in your spirit, which are God's” (1 Cor. 6:19-20). “For none of us liveth to himself, and no man dieth to himself. For whether we live, we live unto the Lord; and whether we die, we die unto the Lord: whether we live therefore, or die, we are the Lord's” (Rom. 14:7-8).